Irizar’s decision to embrace eMobility and enter the city bus market has been a wholehearted one, and a new company was formed in 2016 to foster its ambitions. It has invested heavily to produce the range it now offers, with electric options at 10.8m, 12.0m, 18m and 18.73m. 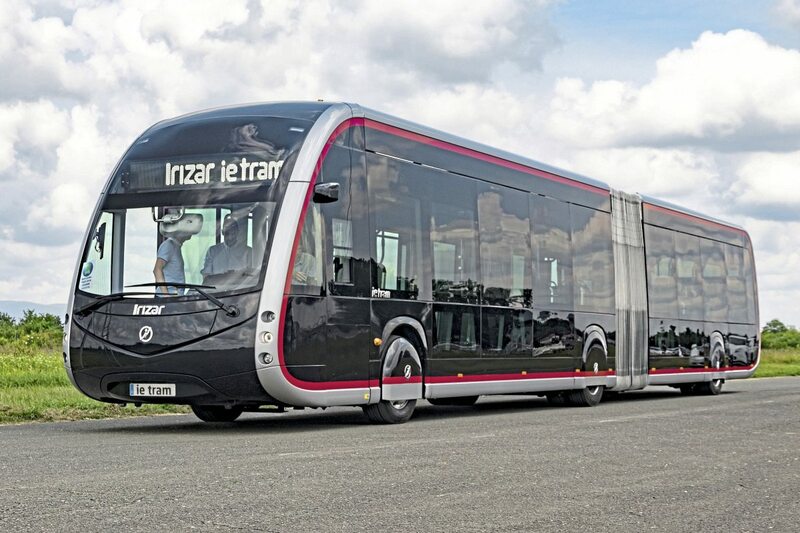 Top of the range is the Irizar ieTram which is aimed at niche applications such as BRT schemes and has styling in keeping with the latest tram designs. It isn’t a tram, it’s a pusher artic bus, but it does succeed in looking like a tram with really distinctive styling set off by a wide brightwork outline to each body side and wheel covers. Furthermore, with a particularly wide turntable mechanism that closely matches the height and width dimensions of the rest of the interior, it also looks like a tram inside with a clear view through from one end to the other. 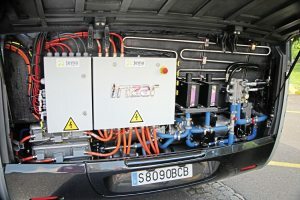 Although Irizar’s first electric bus model, the 12m i2e, made use of Siemens electrical technology, the Irizar group has brought its divisions together to design and develop the whole driveline for the ieTram in-house; a remarkable feat for a company that was solely a coachbuilder less than a decade ago. This technical expertise is not limited to the on-board equipment; a full range of charging options is also produced and offered, enabling Irizar eMobility to offer turnkey solutions. On the bus/tram the options are either the power pack for opportunity charging (as fitted on the test bus) or the energy pack which is primarily for depot or overnight charging applications. Developed in partnership with Cidetec, the power pack utilises between three and five Lithium LTO batteries giving a total capacity of between 90-150kWh and a range between charges of 50-60km. Adding additional packs beyond the standard three adds around €40,000 per pack. The energy pack typically has between 300kWh and 525kWh capacity. Based on an annual mileage of up to 65,000km, Irizar claim the Lithium LTO power pack will have a life span of 16,000 cycles – the equivalent of around 15 years – at which stage it will still retain approximately 80% of the original maximum when fully charged. This works on the principal of a repeated micro charge en-route or at a terminus, which replenish the charge in the batteries, ensuring they are usually working in the 50% to 85% charge range. To facilitate charging a pantograph is installed towards the front of the roof. Charging takes five minutes at a maximum charge power of 500kW. Covering the same mileage, the Lithium NMC batteries should achieve 3,000 cycles before reaching the same stage of depletion, which, because of the less frequent need for recharging, equates to around an eight-year life, Irizar claims. Depot charging would typically be overnight giving the vehicle a full day of autonomy, though daytime top-ups are an option for longer, more demanding routes. A Combo2 plug in system is the norm for depot charging, normally taking three hours (depending on supply) and depots will generally have a smart management system to control the charging of multiple vehicles. Depending on the installed battery capacity, Irizar claim a real-life range of between 220km and 250km. Alone among the three candidates, the ieTram entered was articulated. A 12m version with the same styling has also been designed and is available although none have yet been built or ordered. 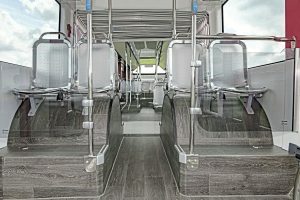 Unusually for an articulated bus, the longer of the two wheelbases was the rear one (5980mm/6540mm) which led those accustomed to driving artics to complain that it felt unnatural and consequently more difficult to position. Available with up to eight doors, the bus entered had four, all on the nearside. 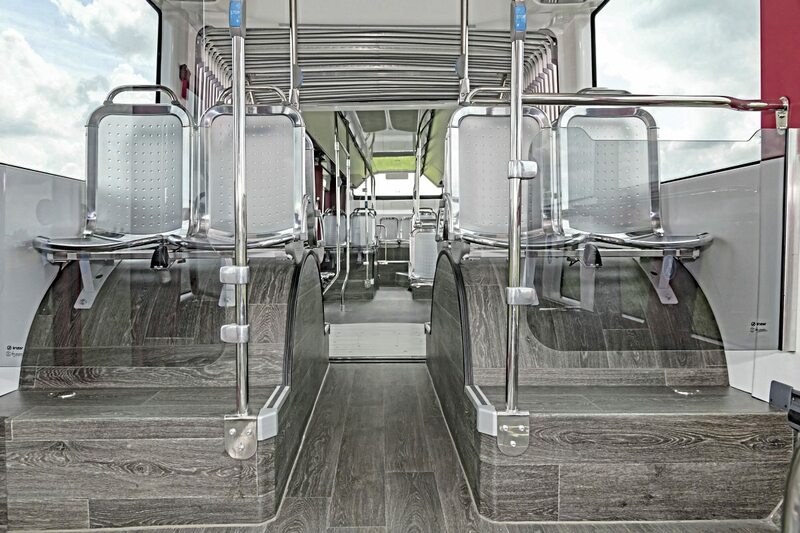 A compromise with the BRT style ieTram rather than the articulated bus version is that the front door is a single unit rather than a double because the sloping A pillar does not leave sufficient space. You could argue that this doesn’t suit the UK boarding model but, as Irizar pointed out, anyone introducing a BRT scheme will almost certainly go for off-bus ticketing. These are manufactured by the French company, Vision Systems, and are fitted as standard with no option for their replacement with the traditional alternative. Reaction to them was mixed but certainly not entirely positive. Though some said it took a few minutes to get used to them, others complained that they did not cover a wide enough area, have a sufficiently high resolution or give an idea of what was directly behind the vehicle. Another reservation was that the driver had to look to his left to see the screen for the lower camera on the right of the bus, which was counter intuitive and confusing. On the positive side, they did make the vehicle look sleeker and minimise the width. More than any of the candidates it was the Irizar that turned heads, confirming the strength of its passenger appeal. I found it both surprisingly quiet at the front and surprisingly noisy at the rear. A minor point was the fragility of the cover over the USB points between the seat pairs. In four places, seatbacks were too upright to be comfortable, in each case to meet the requirement on height between the seat and the floor, where the relationship of the seat back and the wheelarch left no alternative. I felt all of the failings in the interior were readily surmountable and thought it a bright and attractive environment to travel in. In braking tests from 50kmh to a standstill, the heavier articulated ieTram stopped quicker than the other two candidates… within 13.7m, slightly better than the Citaro’s 14.0m, and these results on a ‘best of three runs’ basis. When accelerating it achieved 50kmh in 11.3 seconds (0.6 seconds slower than the Citaro) and 70kmh in 36.6 seconds. Behind the wheel, there were some issues. Several mentioned finding the accelerator difficult to apply smoothly and wanted to see improvement in this area as it made it awkward to drive. One juror described the driving sensation as ‘like riding a wave’. It was somewhat confusing seeing a large dash display showing the rpm of the electric motor and there was criticism of the display overall which was thought to present so much difficult to decipher detail that it became confusing. Added to the previously mentioned mirrors issues, it was noted that the A pillar was 25cm wide. 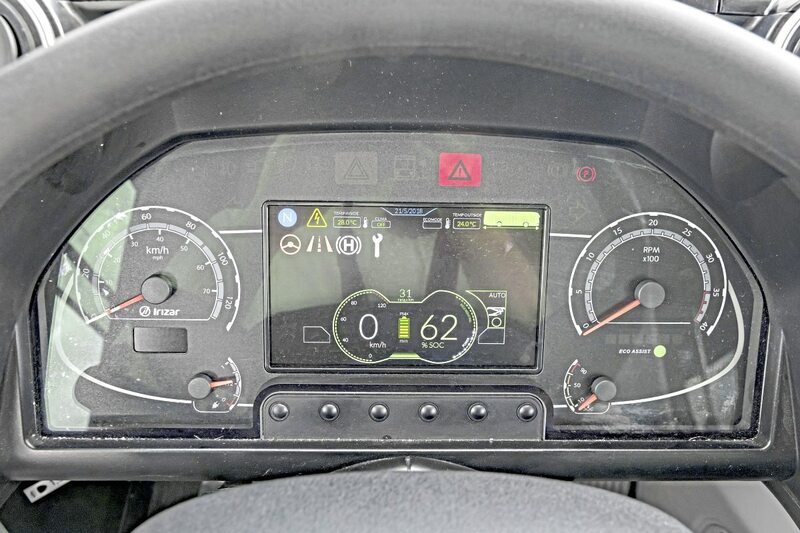 The steering angle was good but manoeuvrability was hampered by what they termed a ‘nervousness’ in the vehicle’s behaviour and consequently some found driving stressful. 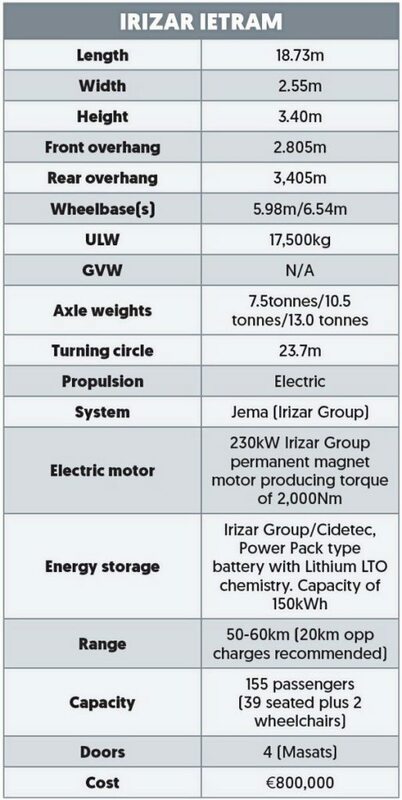 At €800,000 per vehicle, excluding the additional cost of whichever type of charging infrastructure is opted for, the ieTram is not a cheap option and it is difficult to see a commercial operator making this choice. 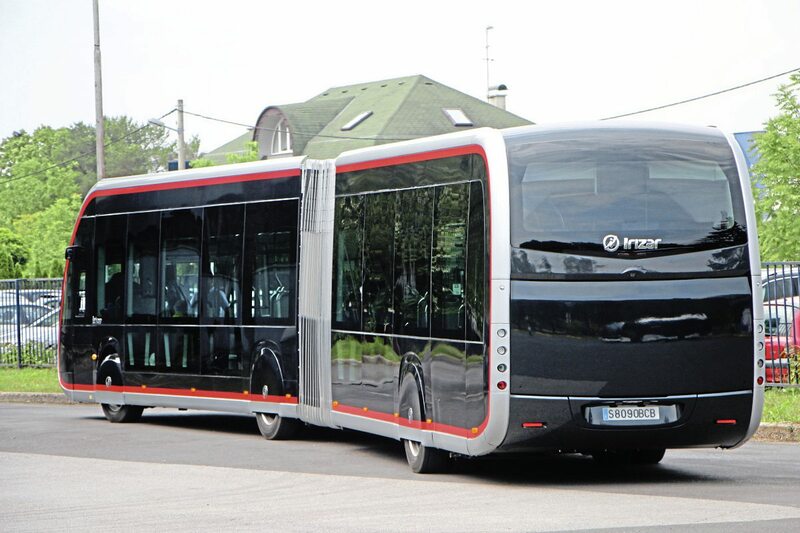 Opting for the structurally similar articulated ieBus which has the same driveline and the option of a double width front door, would, I was told, only reduce the cost by around €30,000. 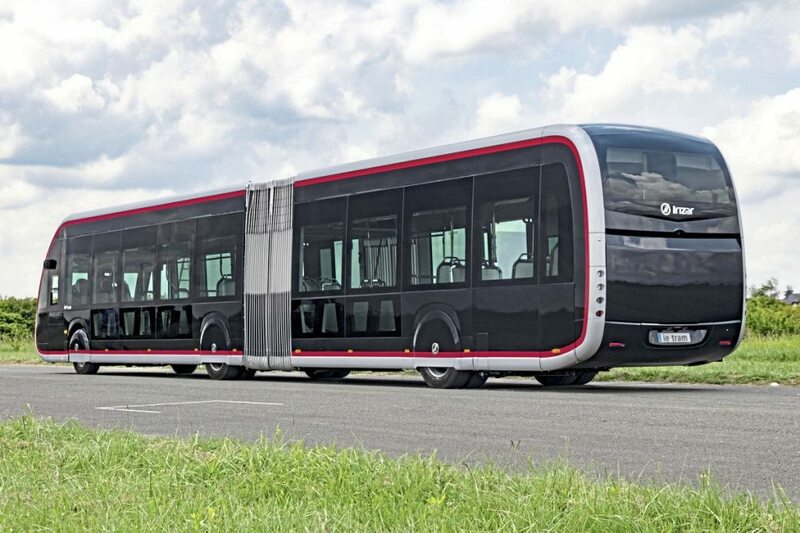 Irizar readily accept that it is a niche product, and see it appealing to local authorities who want a BRT style product to play a high profile tram type role. How many of these there are remains to be seen.